Bucking the trend, the very popular Honda CR-V has not grown over the years: since its introduction in 1995, its size has stayed pretty much the same in the length and width directions, and it has actually become less tall, going from about 70 inches for the early SUV to 65 inches for today's crossover. While in the early days it looked like a utilitarian box on wheels much like the old Jeep, the CR-V has gradually moved its image toward sophistication, to the point that the sides now resemble a Lexus SUV. (There's some poetic justice in this, since the earliest Lexus RX, in my humble opinion, resembled a pregnant Honda Civic: what goes around comes around). Inside the updated exterior is a pretty roomy cabin outfitted with creature comforts: optional leather seats to minimise the plastic surface areas, rear-view camera to help you navigate a cluttered driveway, various distraction technologies, in short, a nice place for people who actually believe that their car is their second living room. Except that this one still has rather smaller windows than the standard living room: I guess the decrease in height has to come from somewhere. 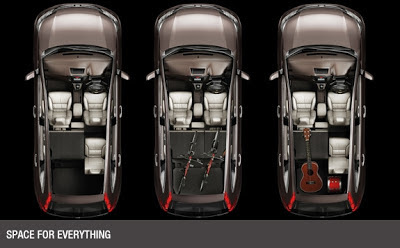 The rear seats can be folded down in a 40-60 split for versatility. The resulting surface is not completely flat, but now you have up to 61 inches space between the backs of the front seats and the rear hatch. 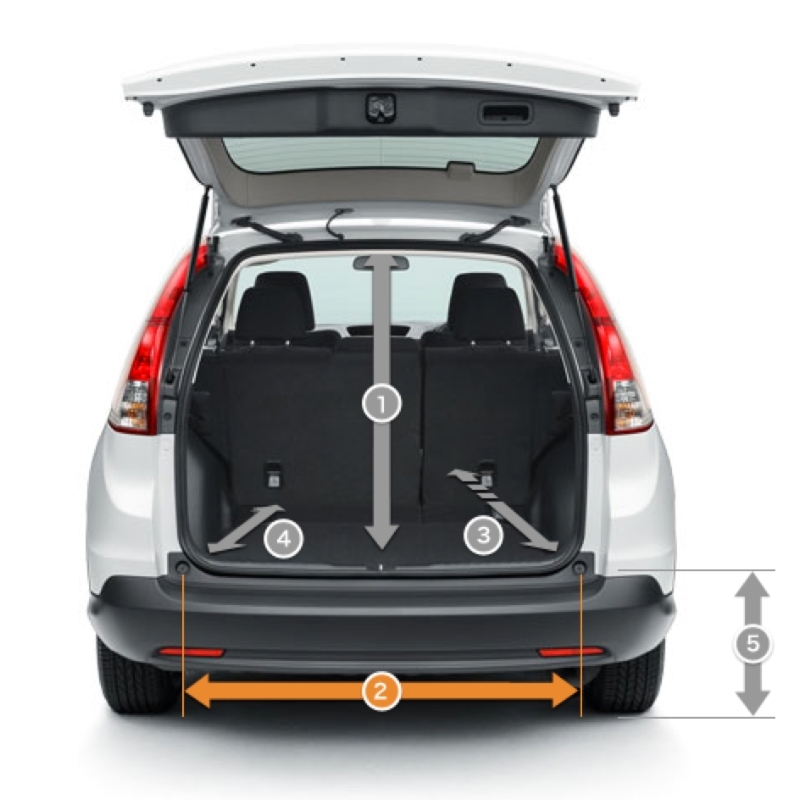 You might need that occasionally: because the wheels wells stick way into the interior, the CR-V's trunk is about 45 inches wide inside, which will just barely accomodate a 3/4 size cello in a soft case. A full size cello will have to go in on the diagonal. 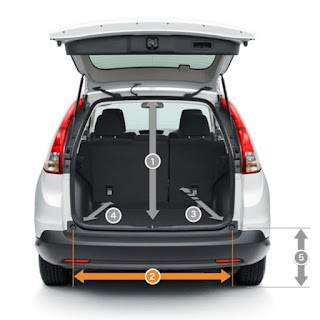 The Japanese site shows two sets of golf clubs fitting across the back of a CR-V. My guess is that the golf clubs inside those bags are relatively short (and would give my very tall brother in law a swingeing backache). 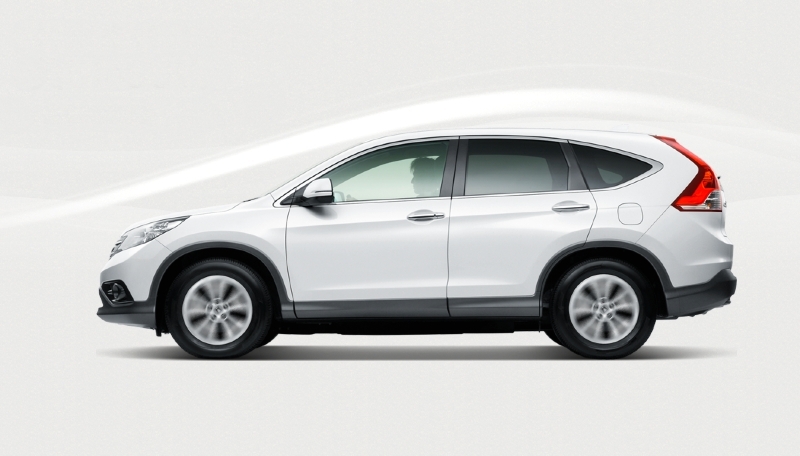 The other interesting thing about Honda's Japanese website is that it shows the CR-V entirely by itself in the "SUV" category, and the placement suggests that it's a luxury vehicle: perhaps for well-to-do Japanese moms whose children play golf. [For the ordinary run-around Honda offers the N box, one of those very Japanese boxes on wheels: it has no trunk space to speak of, but two sliding doors for easy access to the back seat (and for parking in tight spaces); comes in an array of cute colours including a shimmering pink. The fuel efficiency of its 0.66L engine is specified at 57 mpg]. But I digress: back now to the CR-V, which comes in a range of engines: 2.0L and 2.4L gasoline engines, and a 2.2L diesel. Of these, the 2.4L engine is the least frugal (25-26mpg), and the only option for US buyers (orange box in the table below). You can't get it with manual transmission here, either. Which is another lost opportunity for Americans who want to drive a gas sipper. Even in the 2.0L manual CR-V, British drivers report on average 29mpg, even though their driving style tends to be a quite bit more vigorous. The higher fuel economy, and the lower price (smaller engines are always less expensive than larger ones) make the 2.0L an attractive option compared to the 2.4L. The 2.2L diesel does 36 mpg even in British hands, which is 38% better than what you get from the 2.4L gasoline engine. Both the smaller engines still achieve 118 mph top speed. Why don't we invite these diesels here? or at least broaden the choice a little for the American car buyer and get the smaller gasoline engine? Top speed never gets mentioned in the US, but my guess is that the 2.4L engine you can buy in the US now gets you well above 120 mph: not much use for most moms I know. (I don't know any mom who is an avid collector of speeding tickets).